happy friday! can y'all believe that there's only one more friday before we celebrate christmas?! cue my panic attack now. i haven't even come close to finishing my christmas shopping. 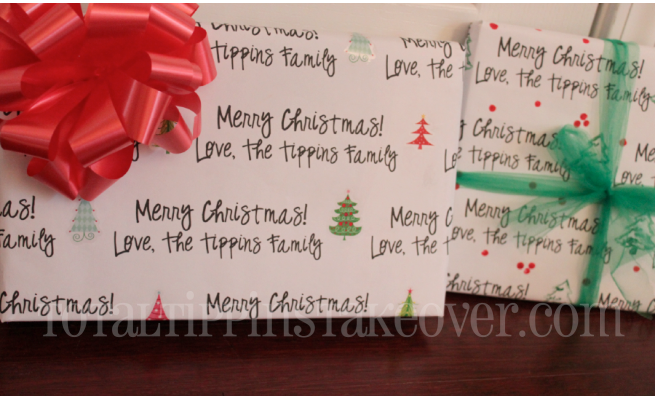 so i may not have many gifts to wrap just yet, but the ones i do have will be wrapped as cute as can be! 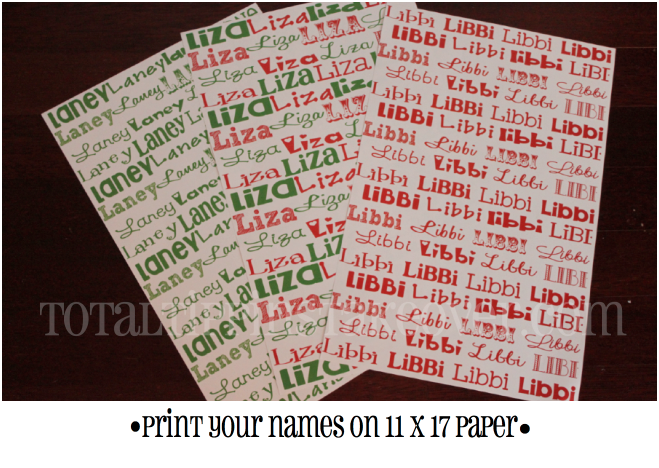 want to make some of your own? it's easy! 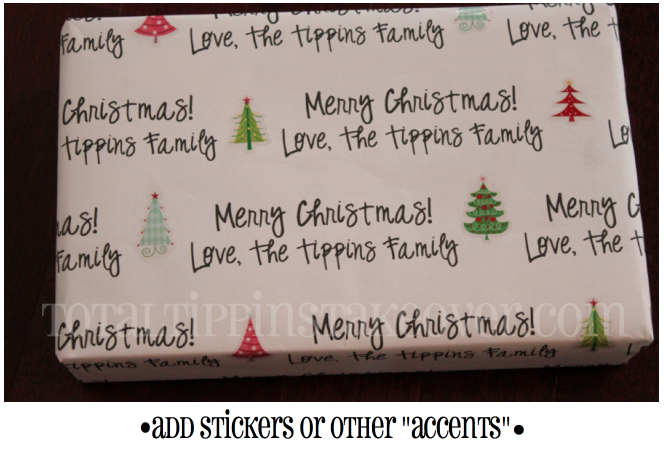 (and inexpensive, too!) 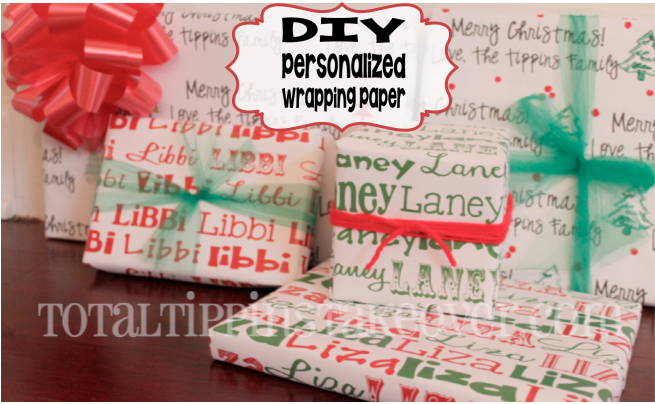 here's a quick little tutorial on how to make your own personalized wrapping paper! there are TWO different types of paper i made.... a color version and a black and white version. i started by setting the margins of my document to 11 x 17. you could make this in any program.... whatever is easiest for you! after i set my margins to 11 x 17, i typed the name i wanted to use all the way across the page and chose different fonts for the name. 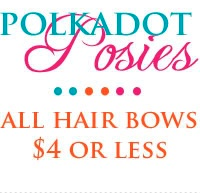 no rhyme or reason to the fonts i chose, just whatever i liked. i typed four different rows of the same name, with four names on each row, using a different font for each separate name (for a total of 16 different fonts). i also spaced every other row over to the right a bit just to break it up a bit. again, no rhyme or reason, just personal preference. after i printed my paper (on a regular old printer! 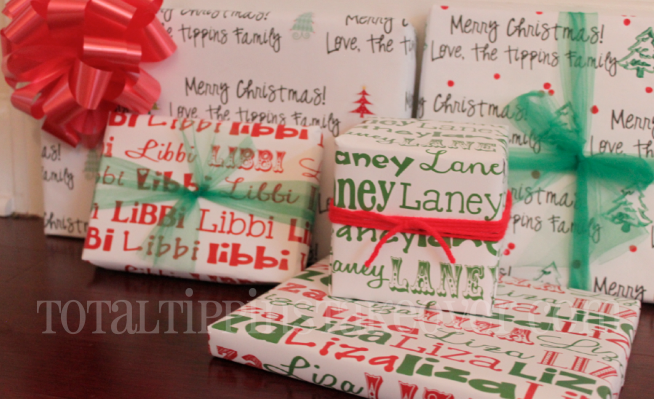 just use "tabloid size" paper), i wrapped my gifts per usual. 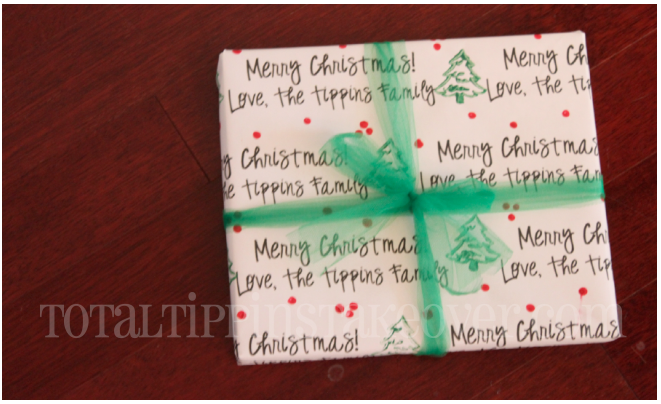 obviously since it's not a huge piece of paper, this wouldn't be ideal for wrapping large gifts or boxes. 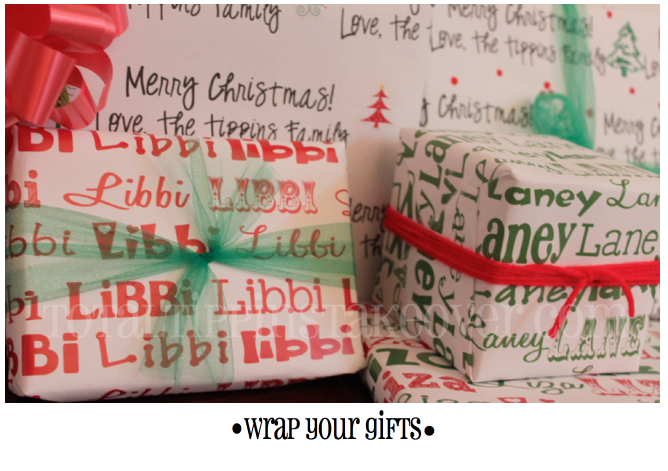 but for those little packages, it's just perfect! 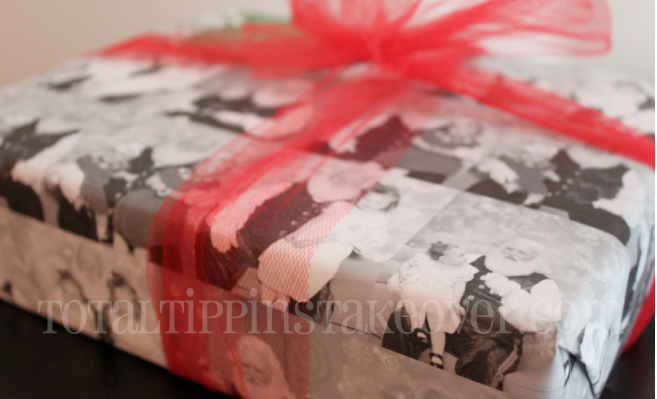 next up, the black and white personalized wrapping paper! 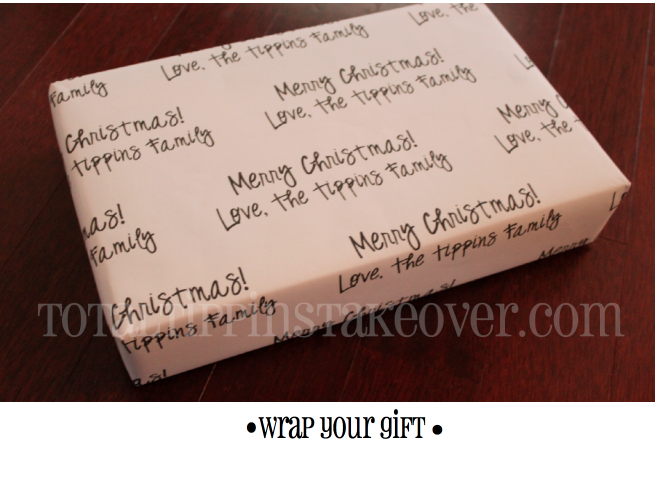 this is a larger sheet of paper and more conducive for wrapping bigger presents. start by setting your margins to 24 x 36. since i had more room to work with, i decided to space out my text a little more this time. because this was a larger document, i sent it off to be printed at my local office supply store. i had office depot print this an an "engineer print" (which can only be done in black and white). 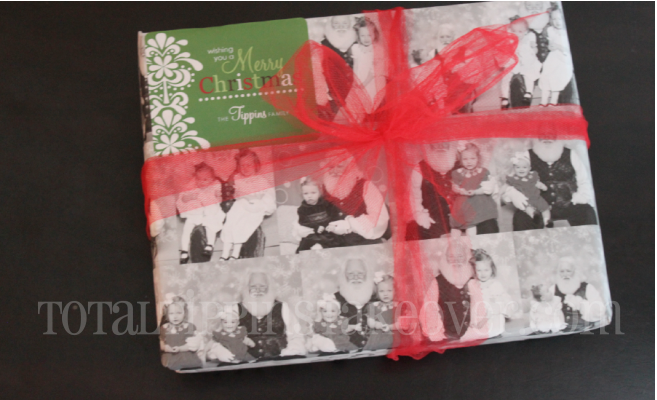 it measures 26 x 34inches and cost somewhere around $1.50 to have it printed - which is cheaper than most store bought rolls of wrapping paper! 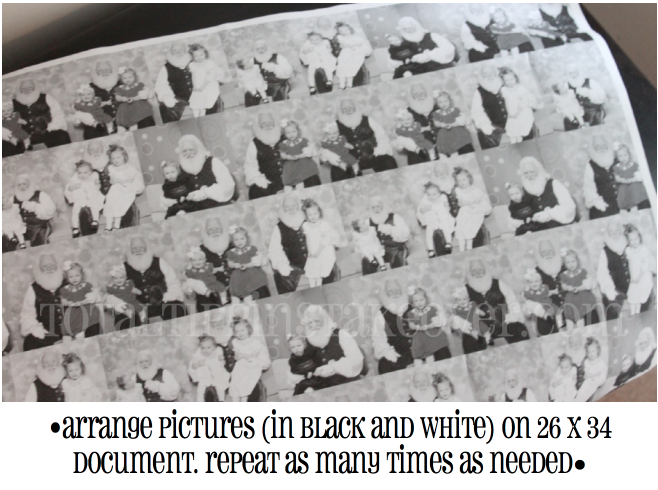 i found all our year's past pictures with santa (- i made this before we had our pictures taken with santa this year.... sorry liza, you were but a twinkle in our eye during these....but new sheets of paper have since been created). i scaled the pictures down to about 3x3inches and made them all black and white. just like with the names, i made full rows of the pictures making a pattern until the row was full. i then copied and pasted it all the way down the page. 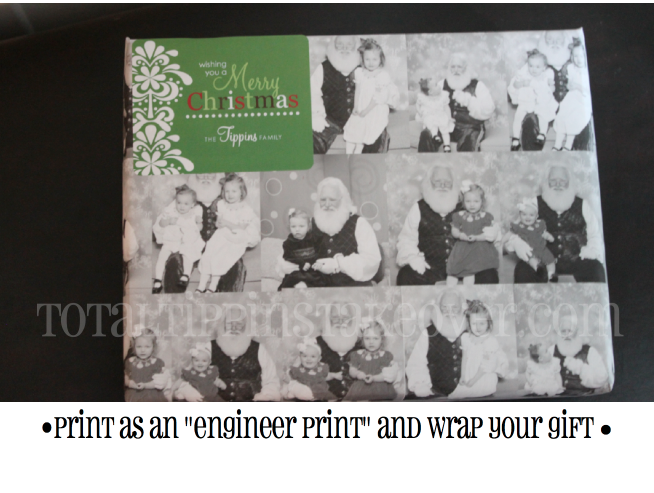 again, i sent it to office depot and had it printed as an "engineer print"
i wrapped up our gifts and added a bow and ta-da! 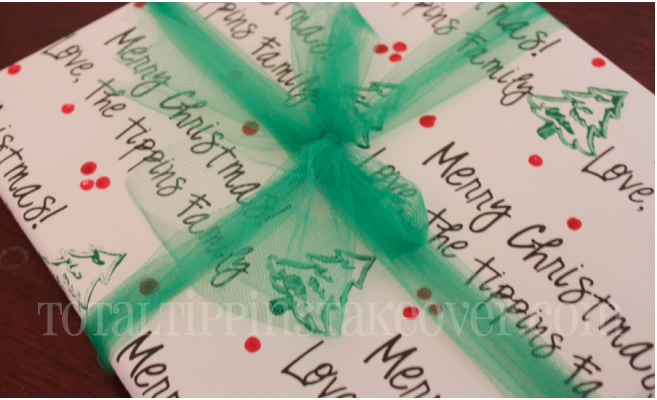 a cute set of personalized santa paper!! 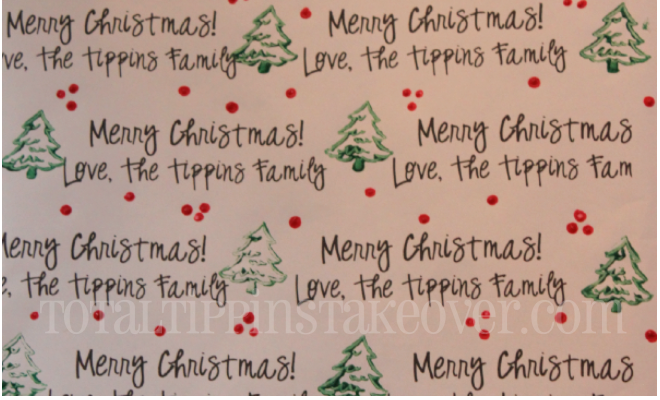 now, i've got to get to shopping or i won't have any presents to use this cute paper on! !